Labour MPs today tore into Jeremy Corbyn for failing to tackle the anti-Semitism crisis as they demanded he finally 'drain the swamp' of racists. 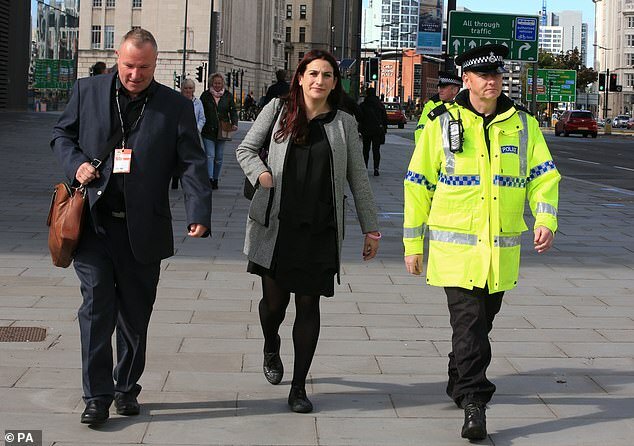 Luciana Berger, a Jewish Labour MP who is being escorted by police officers at her party conference after receiving a wave of abuse, said the party must finally root out the racism. 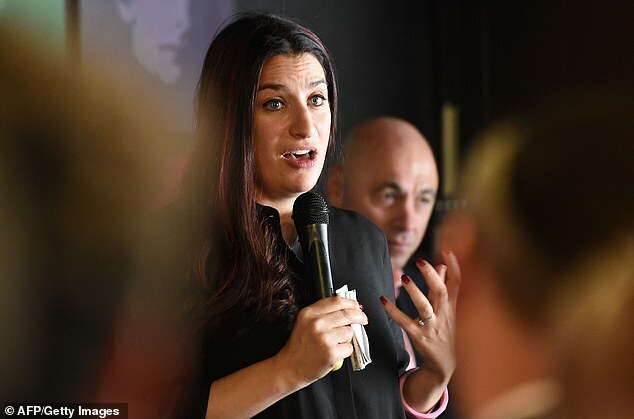 She was joined by half a dozen other Labour MPs who railed against the march of anti-Semitism and warned that 'enough is enough' and Mr Corbyn must take action. 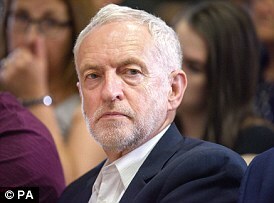 They spoke out hours after the Labour leader appeared on TV where he refused to say sorry as he was confronted with a litany of examples of alleged anti-Semitism. In a highly charged fringe meeting in Liverpool today, a string of Labour MPs and Jewish leaders stood up to denounce the party leadership for allowing the racism to fester. Ms Berger told the packed crowd that Jews are experiencing a growing wave of attacks and abuse - and warned 'there are Jews in this country who do not feel safe'. She added: 'What maters now is draining the swamp. We need to see the Labour Party step up the investigations into complaints of anti-Semitism and get a faster, fairer, more transparent system of internal party justice. She also took a swipe at the 'utterly shameful' bid by Mr Corbyn to water down the definition of anti-Semitism used by the party to discipline its members. Labour MP Stella Creasy told the Jewish Labour Movement event that the racism must be confronted and urgently rooted out. She said: 'Nazism doesn't turn up fully formed wearing black shiny boots and black shirts and goosestepping. Labour plunged into fresh chaos over Brexit today as Jeremy Corbyn said he is ready to endorse another referendum - but a union crony warned that staying the EU should not be an option in any vote. The leader said his preference is to have a general election, but he would 'obviously' comply if party activists demand one. 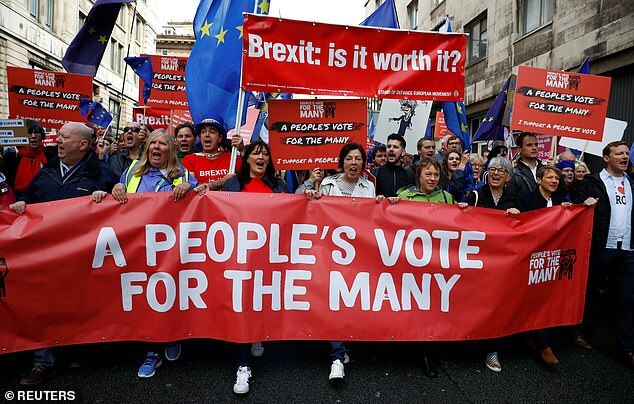 The concession came as MPs joined anti-Brexit protests at the gathering in Liverpool, and deputy leader Tom Watson urged a debate on the issue on the conference floor. But Unite chief Len McCluskey, a key supporter of Mr Corbyn, waded in to the row by insisting even if there is another national vote it should merely be between any package the government negotiates and no deal. He said the public had already settled the fundamental question of whether Britain should leave the bloc in 2016. The manoeuvring lays bare the depth of divisions within Labour over how to handle Brexit - and whether it should happen at all. 'It appears every single day, slowly but surely as the debate is turned. It builds up bit by bit, it gains little by little, it paints itself as the victim - punching up. Mr Corbyn has got to 'stop thinking he is the victim in all of this and he has got to properly explain and apologise for his role and responsibility in the development of this crisis', the Dudley MP said. Labour MP Wes Streeting told the rally: 'We know that anti-Semites in the Labour Party are small in number ... the really troubling thing about anti-Semitism in our party is the bystanders who chose to look the other way and continue to do so now. 'And, worse still, the people who through their words and their actions actively create the conditions in which anti-Semitism can be allowed to fester: Yes, Len McCluskey, I'm talking about you describing anti-Semitism as mood music. And Rosie Duffield, a Labour MP who was threatened with a motion of censure after joining a rally against anti-Semitism in Parliament Square earlier this year, suggested those behind anti-Semitic abuse should be sent on an education trip to Auschwitz. 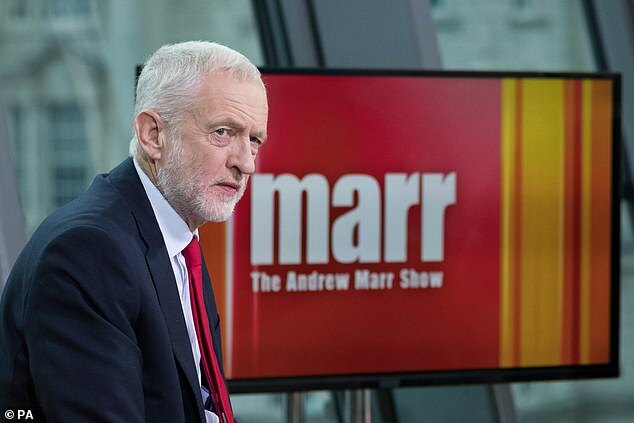 They unleashed their fury hours after Mr Corbyn appeared on the BBC's Andrew Marr Show in which he was confronted by a series of allegations of anti-Semitism. 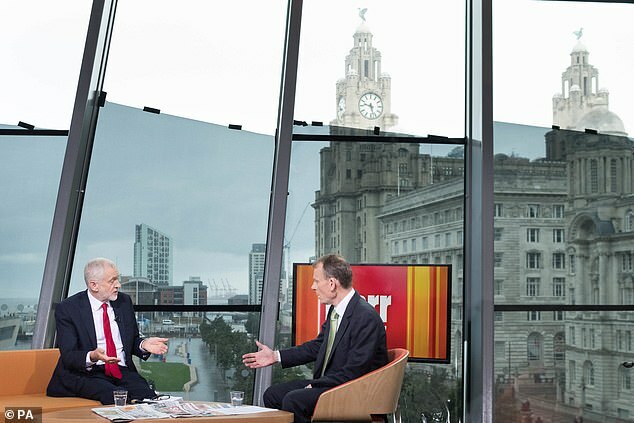 In the bruising interview as Labour conference kicked off in Liverpool, Marr challenged Mr Corbyn on how he had failed to 'notice' that a mural he defended was an anti-Semitic trope. He was also braced on his jibe about some 'British Zionists' not understanding 'English irony', and his attendance at a ceremony in Tunisia honouring terrorists linked to the Munich massacre. But pressed to apologise to the Jewish community, Mr Corbyn merely insisted that he was 'anti-racist' and said Labour was 'welcoming' to all communities. Mr Corbyn said he had been 'hurt' that veteran Labour MP Margaret Hodge and former chief Rabbi Lord Sacks had branded him personally an anti-Semite. 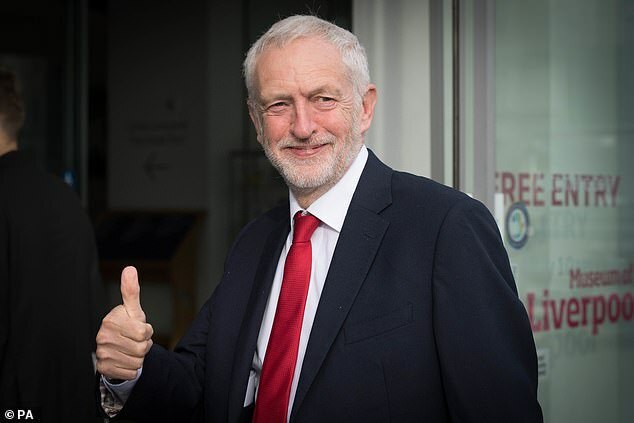 Invited by Marr to look down the lens of the camera and personally apologise to the Jewish community for the anti-Semitism crisis, Mr Corbyn replied: 'I'll simply say this – I am an anti-racist and will die an anti-racist. He insisted that under his leadership rules against anti-Semitism have been toughened up. Mr Corbyn was confronted by a video uncovered by MailOnline when he said some British Zionists had 'no sense of English irony'. He defended himself, saying that he was simply defending the Palestinian ambassador Manuel Hassassian against 'very, very abusive' protesters at the meeting. Asked if he accepted that it was anti-Semitic, Mr Corbyn said: 'Well, it was not intended to be anti-Semitic in any way, and I have no intention – and am opposed in every way to anti-Semitism because I can see where it leads to. 'I can see where it leads to now, in Poland, in Hungary, in central Europe, I can see where it led to in the past. 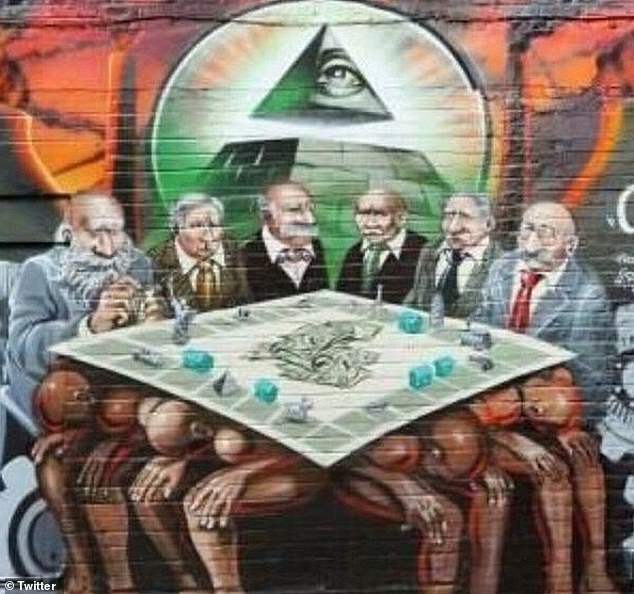 Mr Corbyn was also pressed on his intervention in a decision to remove a mural, which depicts a group of 'hook-nosed' men around a Monopoly board, from a wall in east London. When the artist complained on Facebook that it was being painted over, Mr Corbyn replied: 'Why? ', before going on to condemn previous destruction of controversial political art. Jewish groups condemned the image, saying it contained 'vile anti-Semitic tropes' such as the idea that Jewish people controlled the world. Labour MP Naz Shah is suspended for anti-Semitic posts - including one in which she appeared to endorse calls for Israelis to be deported to the US. Ken Livingstone goes on the radio to defend Ms Shah - but sparks fresh controversy by claiming that Hitler supported Zionism. The Home Affairs Select Committee says Labour is guilty of incompetence over its handling of anti-Semitism and of creating a safe space for people with 'vile attitudes towards Jewish people'. Jewish leaders take the unprecedented step of holding a demonstration outside Parliament protesting Mr Corbyn's failure to tackle anti-Semitism. Meanwhile, Labour Jewish MPs tell of the anti-Semitic abuse they have suffered in a powerful parliamentary debate - and round on their leader for failing to tackle it. Peter Willsman, a strong ally of Jeremy Corbyn, is secretly taped ranting that Jewish 'Trump fanatics' invented the anti-Semitism storm engulfing Labour. In an angry diatribe at a meeting of Labour's ruling executive committee, he said he was 'amazed' there was evidence party members hated Jews. Jeremy Corbyn issues a video insisting he is committed to tackling the racism - but it is panned by Jewish leaders. Corbynistas mount a social media campaign to get deputy Labour leader Tom Watson to quit after he criticises the party's handling of anti-Semitism. The Labour leader insists he was there to honour others killed - but faces fresh calls to quit over the scandal.